Five grants were awared this school year. The SEFT funded: materials used in an environmental studies team project; Xylophones for the music departments; similation software for social studies; an interactive system for learning math; a language system for Early Learning. Fundations is a scientifically research-based program that teaches students the rules for reading and spelling. It is the precursor to the Wilson reading program, but is different from Wilson given that it can be used as a core reading program or (in our case) as a supplement to any reading program. Our objective is to become trained in the implementation of Fundations and to start using the techniques, language, and systematic structure of the program to become highly effective teachers in the area of English Language Arts (specifically reading and spelling). 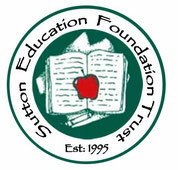 This program can be used for any and all students from grades K-2, however the target population for this program will be any student who is receiving special education support for ELA, Title 1 reading support, or any other student who has been identified as struggling in reading or spelling and receives support via Response to Intervention within the general education class. A focus of second grade is place value, time, skip counting, addition and subtraction. Many students struggle to understand place value, i.e. that the 2 in 24 is different from the 2 in 32. The Learning Carpet will allow our learners to physically move around the hundreds board to see and feel the difference between 2 and 20. The carpet will also be able to be used to assist students in learning the skill of telling time. When students are able to construct their own clock and move the hands and feel the difference between 5 minutes and one hour, it will make that connection much stronger and more transferable to traditional clocks. Skip counting will actually be skip counting on the carpet as students skip over numbers, and addition and subtraction can now be a whole body experience. By purchasing letter tiles, students will be able to use the carpet for hands on reading and spelling practice. Materials will be used with the whole class, small groups, and Response to Intervention groups. All Simonian Center classrooms are inclusive, so students of all abilities will be able to use these materials.